Tonight, we celebrate a rather astounding idea that God is born among us as a child. 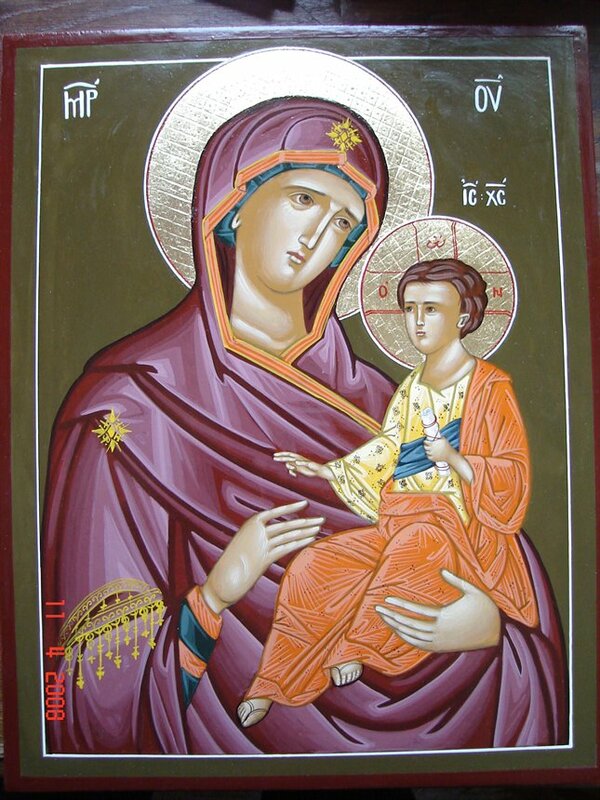 Many medieval paintings, and especially icons of the blessed mother and child show the Christ Child to be huge, as if he were born three years old. He sits on his mother’s lap with his hands in the traditional form for blessing. It is a medieval attempt to wrestle with the great paradox of Christmas. How can the almighty be so confined? How can God be so weak and yet so strong? I remember well when my first son was born. Within minutes of birth I held him in my arms. He was so small, so vulnerable and needy, so impossibly weak. Without our protection, care and nurturing this child couldn’t have lasted a day, an yet the world turned for me, changed, shifted, never to be the same again. It began to come full circle. Contained in that tiny bundle of joy were the first tomorrows of the next generation of our family—so vulnerable and needy, so impossibly weak—and yet so incredibly important! Tonight, we celebrate God as a baby. Maybe, as Joseph took him in his arms, he thought, “But he’s so small, so vulnerable and needy, so impossibly weak! Without our protection, care and nurturing this child couldn’t last a day, and yet, I bet that he, too, felt the world turn, change, shift, never to be the same again. It began to come full circle, for, whether he really comprehended it or not, contained in this tiny bundle of joy were the first true tomorrows of the whole world. So vulnerable and needy, so impossibly weak, and yet so incredibly important. Did he know, did Mary know, did they wonder? How this tiny thing could rule their hearts so completely and easily? How someone so weak could be so strong, and in a way that they, too, took such immense pleasure in yielding to his infant demands? And more, did they know that in doing so they were tending to the needs of their own Creator? God as a baby suggests that the Creator needs us, just as we need him. We usually think about us needing God. If we are honest with ourselves we know the ways we wouldn’t last a day without this child. We, too, are vulnerable and needy, and we know ourselves to be impossibly weak; yet this divine child holds us to be so incredibly important. However, as we take the babe and wrap him in the arms of our hearts this night, we take up the mantle of care for a vulnerable God. He needs our vulnerability in being open, honest and genuine with one another. He needs our generous spirit, that happily shares our incredible riches with those who suffer. He needs us to notice the unnoticed, reach out to the unreachable and love the unloved. Without us this Child wouldn’t last a day. But with our care, the infant God calls forth what is truest, deepest and most human about us, so that with immense pleasure we yield to his infant demands. Yielding and vulnerable with our weak and vulnerable God, we find in our hands the power of another way of being human, not based on greed, selfishness or force, but on self-giving love. Yes, God is at once so weak and yet so strong! On Christmas Eve we both stay at the manger and leave it. Our son grew up. Through the years he got two other brothers, a wife and two children of his own. He is living his own life journey into the heart of God. It continues to be a joy to watch him, help him when he needs us, and be helped when he helps us. He is becoming what he always was inside—a child of God, increasingly awake to the fulness of the divine gift of his own humanity, and increasingly able to live that life into his world. Jesus grew up as well. We have no record of a wife or children, but we do have a record of him living into the fulness of the Godhead manifest in human flesh, whose greatest work was to give his life for us, the pinnacle of self-giving love, the final place of vulnerability and weakness, that proves in the end to be the most powerful thing in the world. We encounter the weak and vulnerable God in the manger. Called by him into a new humanity, we walk away weak and vulnerable, to spend our lives learning to surrender to his rule of self-giving love. The manger forms us and then sends us out to be God-children in the world. We both stay at the manger and we leave it. And when you kiss your little baby, you kiss the face of God? Mary did you know, Mary did you know, Mary did you know…? What a beautiful and impossible paradox, that God would be weak and vulnerable, and that in that weakness and vulnerability lies hidden the power to change the world—beginning with us.